Pineapple desserts and pineapple recipes are loved by most of us. This juicy and tasty pineapple fruit adds a special flavor to any dishes. Especially sweets, cakes, pastries, and puddings. 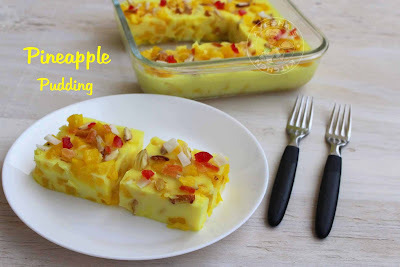 Whenever I get fresh pineapple, I often go for any simple sweets or desserts recipes with this yummy fruit. 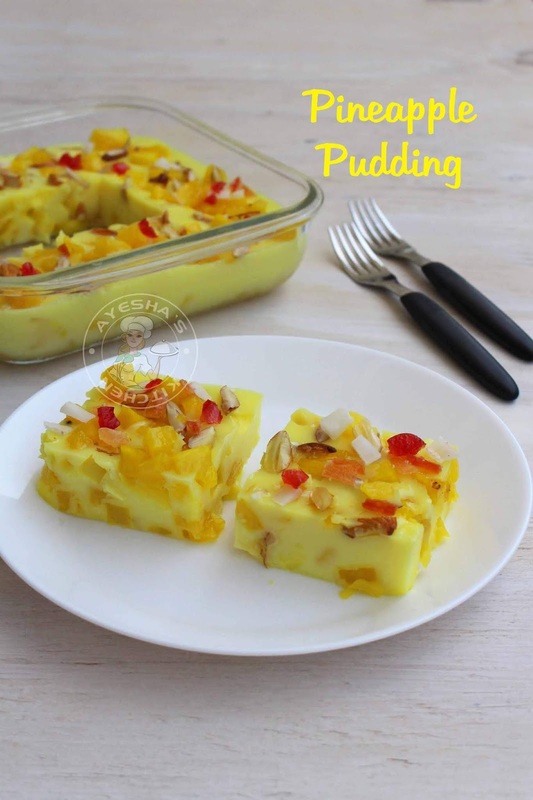 Yeah, this scrumptious pudding is so easy to make and is truly creamy and scrumptious. Pineapple, when added to pudding, imparts a refreshing feel and looks wow because of its golden texture. We all know that pineapple fruit is a very popular fruit which is used in many cuisines around the globe. 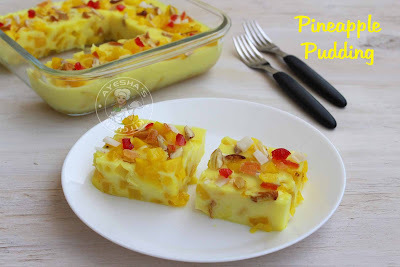 Pineapple jam, pineapple pastry, upside down pineapple cake, pineapple pudding, pineapple payasam, pineapple salad, pineapple rasam etc are some of my favorite recipes with pineapple. Here i saute the finely chopped pineapple along with sugar until done. Cooking pineapple before adding to any desserts gives a fresh taste and fine texture. This sauteed pineapple is added as the base layer to my pudding and is topped with the milk and sugar mixture. Finally, layer the remaining sauteed pineapple over this milk mixture. Garnishing is all upto our choice only. Here I decorate my pudding with some finely sliced almond and chopped dry fruits and cherries. That's all!!! 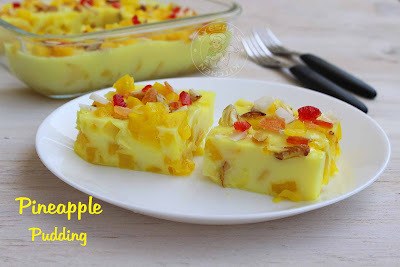 so its very easy to make pudding recipe and is really mind-blowing. Can use chopped cherries, dry fruits also. Heat a pan and saute the finely chopped pineapple along with 4 tbsp of sugar. Once it starts to boil, you can add a pinch of turmeric powder for a yellowish texture. Saute until the water in the pan dries out completely. When done, set aside. Now boil the milk in a pan. Meanwhile, boil the chinagrass along with half a cup of water over a medium-low flame until it melts to a clear liquid. Once the milk starts to boil, add sugar or condensed milk. Combine very well and then add two drops of yellow food color to it. Cook over a low flame. Add the melted chinagrass to this milk mixture. Mix very well. Cook it for a minute and then remove from flame. Now layer half of the sauteed pineapple in a pudding tray. Then pour the prepared hot milk mixture over it. Let it cool for 5 minutes and then layer the remaining sauteed pineapple. Keep refrigerated for 2 to 4 hours. Garnish with sliced almond, chopped dry fruits, and cherries.